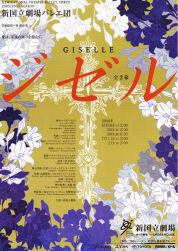 * Clairemarie Osta, who originally was to perform the role of Giselle is unable to perform. Available from Sunday 23 April, 2006 at 10:00am. *A part of Seat F Tickets (¥3,150): Sold at the NNTT Box Office and all Ticket Pia outlets on the performance date only. Up to 2 tickets per person. No phone reservations. *Seat Z(¥1,500): Sold to students only at some Ticket Pia outlets on the day before the performance. Any tickets not sold by the performance date will be released to the general public at the NNTT Box Office and some Ticket Pia outlets. One ticket per person. No phone reservations. Students must bring a valid student ID. *Same day student tickets (50% off, except Seat F and Seat Z): Sold at the NNTT Box Office and some Ticket Pia outlets on the performance date. One ticket per person. No phone reservations. Students must bring a valid student ID. The peasant girl Giselle learns that her lover is in fact a nobleman named Albrecht, who is betrothed to the daughter of a duke, and is so shocked that she goes mad and eventually dies. At night, in the woods, Albrecht visits Giselle's grave and is almost killed by the Wilis, vengeful spirits; but Giselle, who still loves him even after her death, intervenes to save him from her fellow spirits.